Summary and Definition: The Avant-garde Pop Art movement exploded on to the scene during the late 1950's and 1960's. Pop art challenged the traditions of 'High culture', such as classical renaissance art, by moving traditional artistic boundaries to include what was perceived as 'Low culture' inspired by commonplace cultural objects and popular imagery from the world of advertising, cartoons, comic books and mundane cultural objects. Pop Art artists used simplistic shapes with bright, vivid, vibrant colors often accompanied by bold, dark lines. Pop Art appealed to the younger generation who enjoyed experiencing art on a non-traditional, experiential level. Dwight Eisenhower was the 34th American President who served in office from January 20, 1953 to January 20, 1961. One of the important events during his presidency was the introduction of the Pop Art movement and its pioneering artists. Fast, fun facts and Frequently Asked Questions (FAQ's) about the Pop Art. What is Pop Art? Pop Art is a modern art style, a new form of "Popular" art that drew inspiration from cultural icons such as movie stars or popular, mass media imagery as used in comic strips, advertisements and product labels. Artists believed that art could be anything, and made out of anything. When did Pop Art start? Pop Art started in the mid 1950's, gaining in popularity in the 1960's. 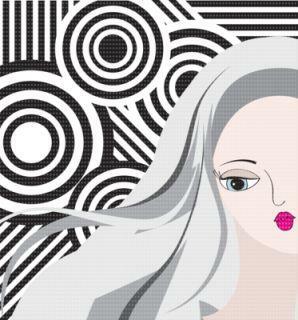 What are the characteristics of Pop Art? 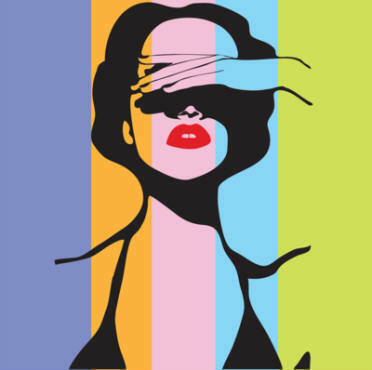 The characteristics of Pop Art include bright, vivid, quirky colors, repetition of shapes, dark bold lines, simplistic shapes and the use of the collage technique. The images were generally presented with a combination of humor, criticism and irony. Who were the main artists of Pop Art? The most famous artists who adopted the Pop Art style were Andy Warhol, David Hockney, Roy Lichtenstein and Peter Blake. Names of other main artists include Eduardo Paolozzi, Jasper Johns and Robert Rauschenberg, Claes Oldenburg, Jim Dine, Tom Wesselmann, Kurt Schwitters, May Wilson, James Rosenquist and Alex Katz. American artist Andy Warhol is the most famous artist of the pop art movement who created iconic works with paintings of popular American products like Campbell soup cans. Andy Warhol also produced celebrity-centered work featuring movie stars such as Marilyn Monroe. English artist Peter Blake achieved world wide fame when he created famous celebrity-centered album cover for the Beatles “Sgt. Pepper’s Lonely Heart Club Band”. America Pop artist Roy Lichtenstein created a distinctive comic-strip style that parodied consumerism and American popular culture inspired by comic strips and advertisements. Another important contributor to the Pop art movement was English artist David Hockney. The roots of Pop Art were inspired by an earlier movement called Dadaism (1916 -1923) which flouted conventional aesthetic and cultural values. Dadaism rejected traditional art forms and mocked the established art world by appropriating images from the street and the commercial world. The following fact sheet contains interesting information, history and facts on Pop Art for kids. Pop Art Facts - 1: Pop Art emerged in the mid 1950's and flourished in the 1960s in both America and Britain. It was a cultural revolution in which artists moved away from conventions and conformity creating art directly from everyday items, consumer goods, and mass media. Pop Art Facts - 2: Pop artists such as Andy Warhol and Roy Lichtenstein favored realism, using everyday, mundane imagery combined with heavy doses of humor, irony and wit. Pop Art Facts - 3: The movement reflected the changing times and the rise of consumerism, advertising, celebrity, experimentation, pop music and rock and roll. Pop Art Facts - 4: Comic books were enjoying a revival and artists began to make use of panels, balloons (speech bubbles) and characters in their work. Pop Art Facts - 5: Characters such as Batman were extremely popular and the 1960's TV series was produced as a pop-art campy comedy in which cartoon style balloons were interspersed with the plt and the actors. Pop Art Facts - 6: Roy Lichtenstein painted Look Mickey in 1961, based on Mickey Mouse, and created a distinctive comic-strip style which achieved fame with his 1963 work entitled Crying Girl. In "Sweet Dreams Baby!" Lichtenstein created a cartoon character whose movement was emphasized by the word "POW!" Pop Art Facts - 7: The youth counterculture was emerging. Bill Haley, Jerry Lee Lewis, Elvis Presley popularized rock and roll. Television replaced radio as the dominant media outlet and Marilyn Monroe, James Dean and Marlon Brando were the favored movie stars. Pop Art Facts - 8: Andy Warhol created work featuring the celebrities of the era. The image of Marilyn Monroe, based on a publicity photo, is repeated again and again, with variations of color and printing quality. His triple image of Elvis Presley depicts the rock 'n' roll heartthrob as a cowboy, armed and shooting from the hip. Andy Warhol's iconic repeated image of Marlon Brando strongly conveys the sexual appeal of the star in his leather jacket. The following fact sheet continues with facts about Pop Art. Pop Art Facts - 9: Andy Warhol, initially from a commercial art background, also created work based on popular American products like Campbell soup cans and Coca-Cola bottles. Warhol frequently used silk-screening and his later drawings were traced from slide projections. Pop Art Facts - 10: Andy Warhol also produced sculptures, his most famous sculpture was his 'Brillo Boxes' created on silk-screened ink on wood replicas of the large, branded cardboard boxes used to hold 24 packages of Brillo soap pads. Pop Art Facts - 16: English artist Peter Blake, the "Godfather of Pop Art", was famous for his celebrity-centered album cover for the Beatles "Sgt. Pepper’s Lonely Heart Club Band". Pop Art Facts - 17: James Rosenquist, originally a a billboard painter, took fragmented, odd images and overlapped and combined them to create visual stories on canvas. Pop Art Facts - 18: American painter Robert Rauschenberg used photographs which he transferred to the canvas by means of the silkscreen process. Pop Art Facts - 19: The Psychedelic art movement of the late 1960s followed on from the Pop Art movement. Psychedelic art was inspired by psychedelic experiences induced by taking drugs such as LSD during the Hippie Counterculture era.